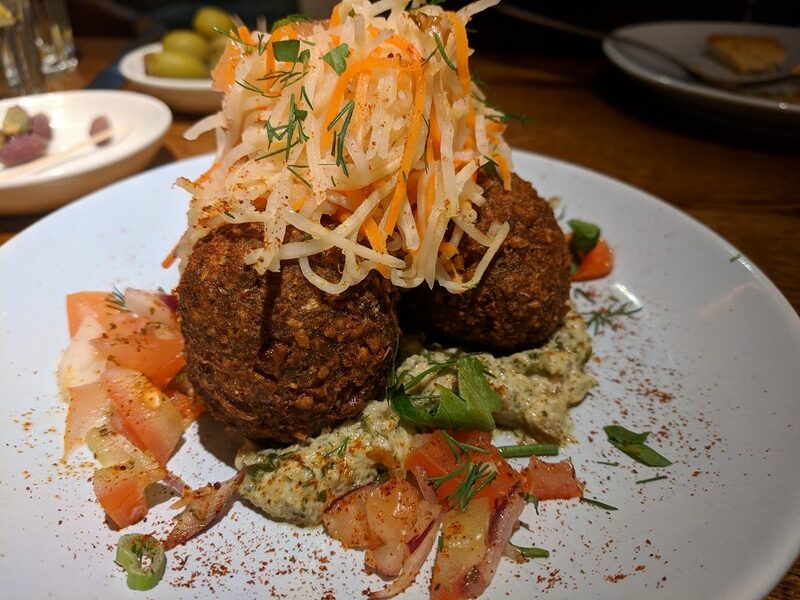 The Real Greek has launched its full Vegan menu – a good excuse for me to revisit an old favourite with a new twist, my local Reading restaurant. I haven’t been here for a few weeks, but the manager recognises me and greets me and my date with a warm handshake. I feel good already. It’s a Thursday night and the place is busy, but tables are available and one has my name on it. The Real Greek is all about good food and sharing, and to that end, dishes can be mixed and matched so that everyone has something to eat and share. From good food comes good conversation and this format is ideal for couples, groups on even first dates. We ordered a mix of starters and mains, which involved much discussion and debate about what to have that we both would share. There are a lot of dishes and obviously, you can’t try them all in one sitting, so friendly negotiation goes on to decide on what to have that isn’t too much and everyone will like. Rather scarily, they also include the calorie count on each menu item – I’ve always found some of these surprising but, at least if you are trying to keep an eye on your diet, you can do so easily. If you cannot decide what to eat, The Real Greek offers a Filoxenia on the menu, a selection of dishes to share. The translation of the Greek word “philoxenia” means “friend to the stranger” or “food to share” with your guest, although its historical basis and overall meaning is much more about “generosity of spirit”. For first nibbles, we got The Real Greek Olives, large green olives with the occasional small black one thrown in for a contrast of flavours. 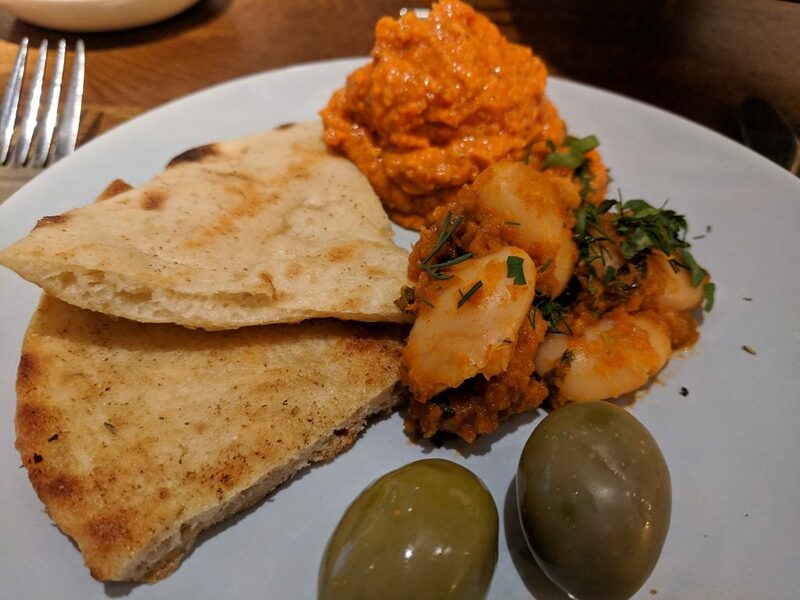 A moorish classic we enjoyed combined with Greek Flatbread with Olive Oil and Dukkah. Made in Mediterranean style, Dukkah is a spicy mix of dry ground roasted nuts and seeds. Great for curbing your appetite while you browse through the menu. 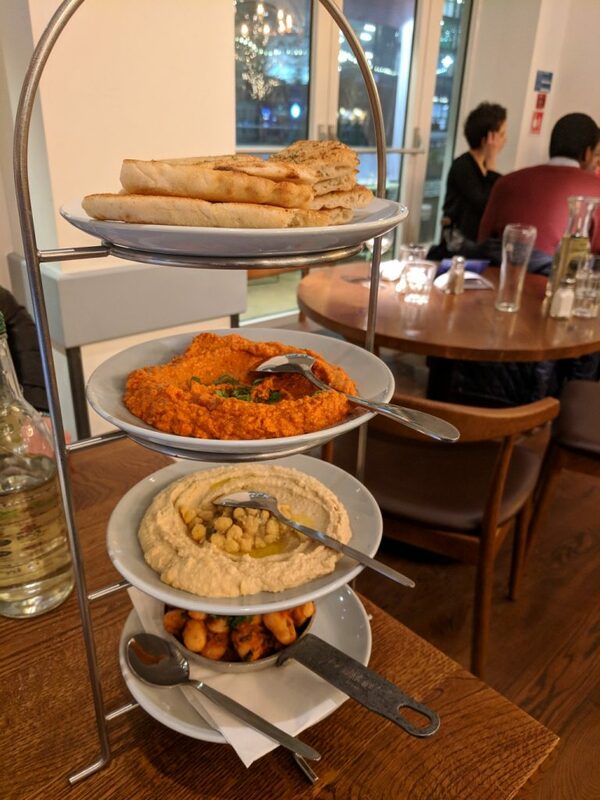 Although the menu is split into starters and mains, the dishes come to your table as they are prepared from the kitchen if you want it that way. So, you can mix your starters up with the mains, not waiting for anything to be cleared away first. I picked a Spicy Walnut and Red Pepper Dip. Vibrant orange and peppery, almost like chilli with a nice dry finish. It has similar flavours to the Lebanese Mhamara but is designed to be used as a dip or paste. My date went for the Hummus, with fresh, citrus flavours, as always is a typical Greek stalwart. The dishes are all served on “towers” which maximises table space and allows for easy sharing of plates. No formality here, you can take plates and put them back in any order. Empty ones are removed almost invisibly by the staff to make more space. She also ordered Gigandes Plaki (433k) large white beans, crisp and fresh. It reminded her of the beans sold in markets in Morocco and she described it as truly authentic. No higher praise. No Greek meal would be complete without a good beer, and The Real Greek has a range of Greek beers to try. 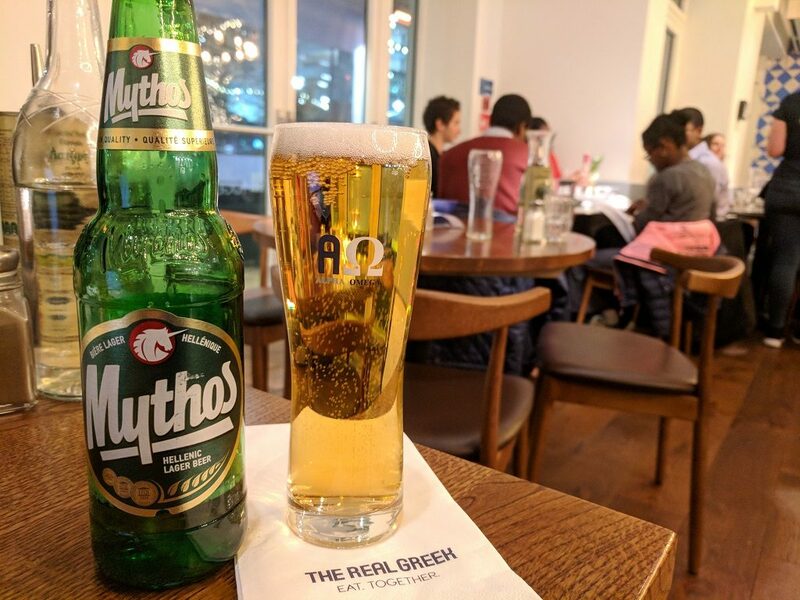 I went for a Mythos (or two), a very light and smooth Mediterranean lager style beer. With delicate flavours it works well with the Vegan menu, complementing the food rather than overpowering it. If you want something else, there is also a good selection of wines and non-alcoholic drinks. The Real Greek has a good range of vegan main dishes on the menu too, and we chose an assortment. 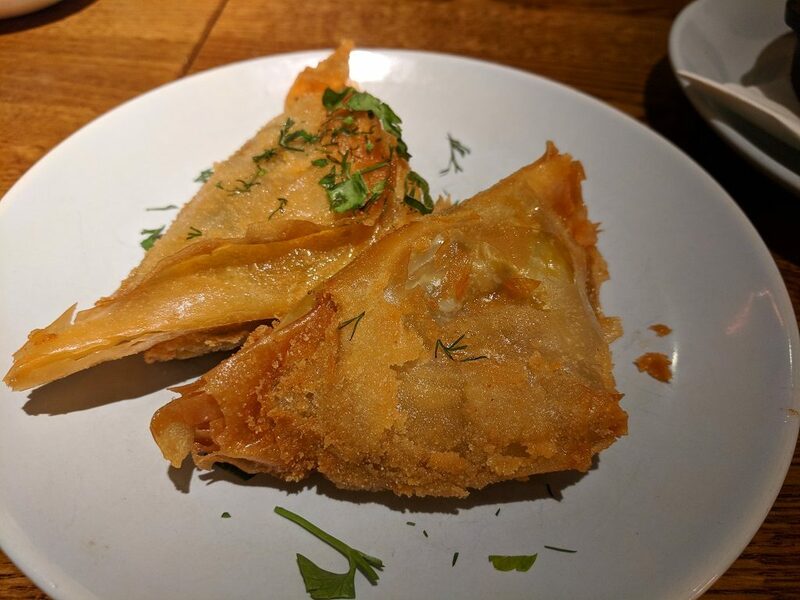 First up, Chickpea Filo Triangles (593k) with crispy filo around chickpeas, cumin, turmeric and a smidge of sundried tomato and chilli. Then Braised Artichokes (160k); Whole artichoke bases in a thick soup with baby onions and dressed with broad leaf parsley. Organic baby carrots in the middle of each artichoke still crunchy with that baby carrot flavour. 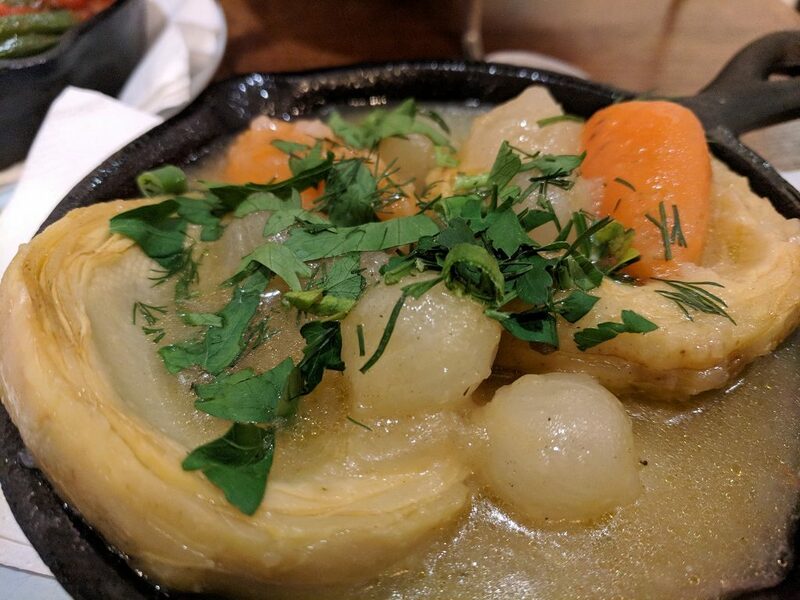 The artichokes sit in a broth of lemon and mustard with the baby onions. The zest of the lemon melds with the baby onions to give a nice stock you can eat on its own. The onions are a red herring design to fool your taste buds; they actually pick up a lot of the lemon flavour and don’t taste of onion at all. All in all, this was my favourite dish on the whole menu. 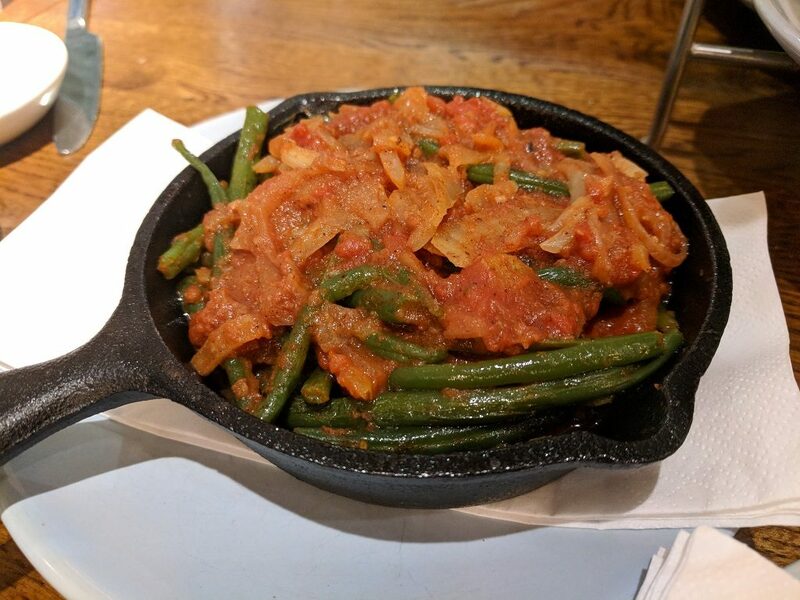 A great sounding dish of Green Beans Fennel & Tomatoe (Fasolakia) (100k) was also chosen. The cinnamon sounds like an interesting touch, but it ads a bitterness which you will either love or hate. We didn’t really like it, but it is unusual and not just a plate of plain dull beans. I guess it’s like marmite, but in this case, even the slightest hint of cinnamon was too strong. Always my date’s favourite, we ordered the Real Greek Falafel (369K). Crunchy outside, soft inner with incredible flavour. Topped with crunchy coleslaw, without the usual cream, that properly accompanies the dish. “They are perfect” she said. 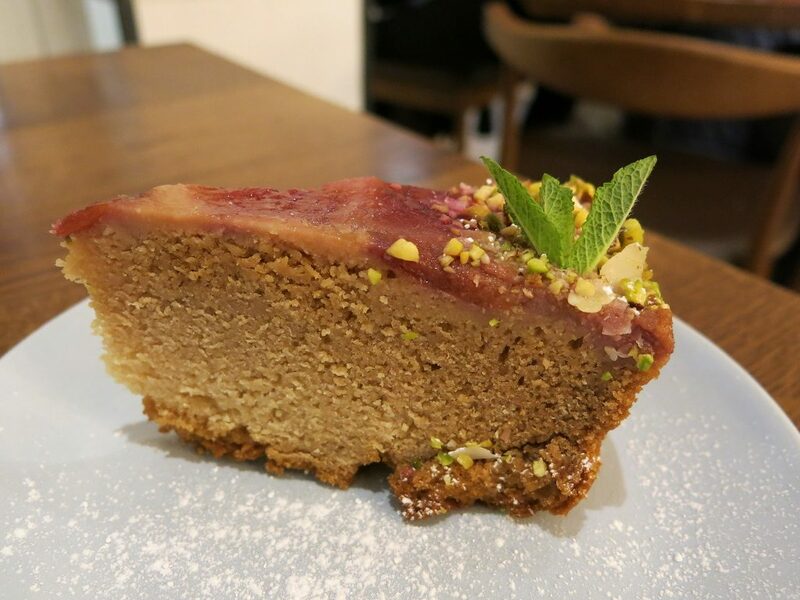 By now, my date was too full for dessert – wow, that’s a first for a vegan restaurant and shows how good the food is here, not just in flavour but also portion size. In the interests of researching the full Real Greek experience, I went for the Plum Almond and Pistachio cake (533k). The cake mix is almost like a dry cheesecake, with blended plum and almond flavours. It is quite filling, and as it says on the menu, should be taken with tea, coffee or a dessert wine. I couldn’t manage it all, so snuck half of it home in a doggy bag. Well, it was too good to leave! The Real Greek has a number of restaurants in the UK – we were guests of The Real Greek Reading. The plum and pistachio cake looks amazing!